We all know that being a parent isn’t easy. In fact, I think the US Army got it wrong. It’s actually being a parent that’s the toughest job you’ll ever love, not a military career. Generally, we have the same goal: to raise good, responsible, productive human beings who will hopefully love us and not boot us off to a nursing home when we get old. There will be some variations on that, but most of us don’t strive for raising a serial killer, anyway. One thing that I’ve noticed through the years is an increase in entitled behavior. There’s this sense that the world owes a person something and that rules are for other people. If you’ve ever worked retail or with the public in any fashion, chances are good that you’ve noticed this, too. 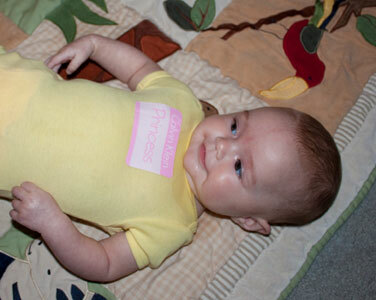 Eudora rocking her “Princess” onesie. She’s right. There are some bratty little girls out there who are this way because their parents taught them that they are all special little snowflakes who are above certain things in life. Whether it’s things like doing the dishes or being polite to retail workers, it can be unpleasant. Sometimes that entitlement continues through childhood an all the way into university. But are those “speshul snowflakes” obnoxious because of the princess phenomenon? I don’t think so. I suspect that there’s a lot more to it than Mom or Dad calling a little girl a princess. Charlie and the Chocolate Factory’s Veruca Salt wasn’t a brat because of princesses. She was a brat because her parents let her be one and refused to set limits. There are two glaringly different ways that the princess phenomenon can go. You can end up with the little Veruca Salt monsters who grow up into entitled adults because the “speshul snowflake” treatment went wrong. Or you can take it the other way. “Princess” does not have to equal “spoiled brat.” After all, there are other reasons why little girls often love the princess phenomenon: pretty, intelligent, poised women in beautiful dresses, etc. There’s a lot of responsibility involved with being a princess. She needs to grow up to be able to do anything and take on anything that the world throws at her. She needs to be educated and able to interact with a variety of people. She also needs to realize that she needs to treat people with respect if she wants to be respected. There was one other bit that Heather had said about why she’s avoiding the “cult of princesses.” She said, “Plus my daughter can be what and who she wants to be, not just some steroetype.” Yes, she can. But isn’t that the point of being a princess? Having the ability to do anything under the sun? What do you think about the princess phenomenon? Is it something that you embrace, or is it something that you avoid because it doesn’t fit with your ideas of being a parent? You know how I feel about the self-entitled little brats (and adults) running around these days–can’t stand them. But the princess thing doesn’t bother me at all. My oldest daughter is obsessed with princesses–obsessed. We call her “princess,” and she calls me the queen (she’s got that right!). But I also have a very take-no-$h!+ attitude, and even at three my daughter knows this too. I guess the princess thing doesn’t bother me for girls any more than the superhero thing would bother me if I had boys. It’s all pretend play, and if they want to dress up and they attribute awesome qualities to it, then great. Princess Diana was a model of all things fabulous–grace, poise, caring nature, concern for the poor and sick…. These days, even the Disney Princesses aren’t all that bad. We have a Disney Princess early reader book that talks about what a princess is: “A princess is kind,” “A princess is smart,” “A princess has good manners,” etc. I like that. I also like the modern take on a princess where, while romance is certainly in their future [hey, there’s nothing wrong with a little lovin’], they don’t really *need* a prince. Belle (ignoring how absolutely psychotic she is) is a voracious reader, who loves her dad more than anything. Tiana was an independent woman of color in the 1920s South, who wanted to open her own restaurant. Rapunzel beat Flynn Ryder over the head with a skillet and gathered the hearts and minds of a room full of “roughians.” (and on and on and on). In my house, we use the “princess” thing to instill good manners. Would Cinderella put her feet on the table (or in her mouth, FML)? Of course not. Would Snow White ever ask for something without saying “please”? Psshaw. Would Princess Fiona belch without saying “excuse me”? [okay, okay, bad example]. Yes, you can teach good manners without invoking a monarch, but since she already loves princesses, why not use it to my advantage? I totally agree with you that brats are born of indulgent parenting, not of labels. I’ve seen 20-year old “men” acting like entitled little you-know-what’s, and I’m pretty sure no one ever called them “princess.” I’m 30mumblemumble, and my dad *still* calls me princess, but I’ve been working since I was 14. I totally get why many moms don’t like the princess thing. It’s definitely not for everyone. But, even as a feminist, it doesn’t bother me one bit. Interesting, although I haven’t really thought about it; I have two daughters but neither of them ever had any particular interest in princesses. (Although if the younger one had ever come up with the idea of kitty princesses that might have been different :)) So it isn’t universal but I can’t say why some girls are into it and others aren’t. I don’t mind princesses. I think the point that it becomes a brat problem has to do with parenting, not with princesses specifically. The entitlement attitude is absolutely a problem, though, and I would love for more parents to try to teach responsibility and ownership. I will admit that my daughter has one pink onesie with princess on it. I picked it up at a garage sale because it also has dance shoes on it. Yes, being a “princess” does not make a little girl entitled or bratty. Sadly though, all too many of the parents who treat their daughters like princesses allow the entitlement and brattiness. As you say, it’s not about princesses, it’s about parenting.